Last week Mr.Parveen Bali having educational background in journalism discussed the history of radio . Children are participating in radio club activities more seriously day by day. Yes, children never forget to laugh .it is fun to be in the club. Always be an inspiration for children participation in radio club activities. Talent (Singing,story telling poetry ,etc.) hunt for All India Radio recording was launched by Pallavi Nada Team and Mr.Parveen and Mr.Sanjeev of Balbhawan Mandi. Club Members will be visiting AIR Delhi station on 21st June and 23rd June respectively. 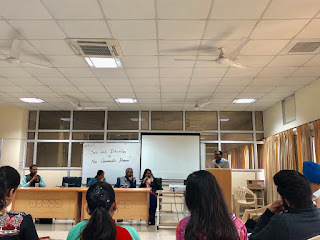 Mr.Parveen Bali discussed about history of radio in India and how it works. News reporters were identified and deputed to gather news from different department. Today Mr.Suneel Vatsyayan Chairman Nada India and Ms.Pallavi also guided with participatory approach during talent hunt and news gathering classes. Mr.Vatsyayan added presently, radio club community is limited to Bal Bhawan Mandi village. Each child is important and what he does and talks is a news. Mr.Bisth Officer In-charge is taking personal interest in the day to day activities of the club. We continue to get all technical support in editing from Mr.Narender in-charge computer department of Balbhawan Mandi.